A kind and good fairy, Flora is always dressed in red. The leader of the group, she helps Fauna and Merryweather make the right decisions. Flora helped Sora prepare for his journey with just the right traveling clothes. A sweet and gentle fairy, Fauna dresses in green. Always eager to please, she only uses magic to help others. Fauna helped Sora prepare for his journey with just the right traveling clothes. A spirited fairy dressed in blue, Merryweather can sometimes be a bit stubborn. Together with Fauna and Flora, she tries to stop Maleficent from harming others. Merryweather helped Sora prepare for his journey with just the right traveling clothes. The fairy dressed in red. While scatterbrained at times, she acts as the leader of the tree. Flora gave the newborn Aurora the gift of beauty. To keep her safe from Maleficent, the three fairies lived with the princess in a cottage in the forest for 16 years. The fairy dressed in green. She is the most level-headed of the three. Fauna gave the newborn Aurora the gift of song. The fairy dressed in blue. She can be stubborn at times, and often bickers with Flora. Merryweather gave the newborn Aurora a ray of hope as her gift. Flora, Fauna, and Merryweather are the three good fairies who live with Master Yen Sid in his tower in Kingdom Hearts II. They originally come from the world Enchanted Dominion and appear in Kingdom Hearts Birth by Sleep and Kingdom Hearts Union χ. The three fairies also appear on Aurora's pillar during Sora's Awakening in Kingdom Hearts. The fairies offering to help Ventus return Aurora's stolen heart. The three fairies appear during Ventus's visit after Maleficent took Aurora's heart using Terra's darkness. Together, they descend into Maleficent's castle to retrieve her heart. After her heart is released, Ventus meets Maleficent in a battle and leaves after Aqua arrives. With Ventus gone, the three fairies find Aqua in a cell, where they meet Prince Phillip, the only true love who can break the curse laid upon Princess Aurora. The three fairies help Aqua and Prince Phillip to the castle and defeat Maleficent in dragon form. At the end of the story, Prince Phillip kisses Aurora and breaks the spell. Some time after the battle at the Keyblade Graveyard, the three fairies observe the couple as they dance. When Flora sees the blue color on Aurora's dress, she changes it to pink and Merryweather changes it back to blue. The two fairies continue this throughout the rest of the dance. The three fairies give Sora his new outfit after he wakes from his year-long sleep, as well as the Star Seeker Keyblade and the ability to use Drive. Comically, they get into a brief dispute about the color of Sora's clothes, until Sora impatiently asks them to stop arguing and just decide. When Diablo brings Maleficent's robe to Yen Sid's Tower, the fairies' memories accidentally bring her back to life and they rush to tell Yen Sid. Yen Sid mentions to Mickey, Donald, and Goofy that Lea is being trained to summon the Keyblade in a magically suppressed training session under the three fairies and Merlin. To aid Mickey and Riku's mission to rescue Aqua from the Realm of Darkness, Flora, Fauna, and Merryweather crafted new garments to shield them from the darkness, which Yen Sid gives them before they depart. Along with Riku and Mickey's new clothes, the good fairies also created garments for Sora, Lea, and Kairi. Yen Sid gave Sora his directly, while Riku and Mickey took Lea and Kairi's to deliver to them while they were training with Merlin. All three of the fairies have short, grey hair, carry a yellow wand, and wear conical hats with a chinstrap made of cloth that wraps around the cone of the hat. They all wear long-sleeved dresses and capes that are nearly identical, except in terms of color. They are all roughly the same height as well. 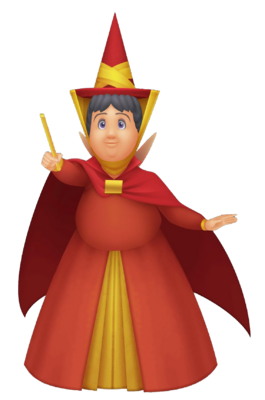 Flora is between the other two fairies in terms of weight and dresses in a red dress and cape, with a gold skirt under the dress with gold cuffs. Her cape is secured by a rectangular, gold broach. Her wings are small, triangular, and have a faint, red tint. Her hat is also red, and the cloth wrapped around it is gold. 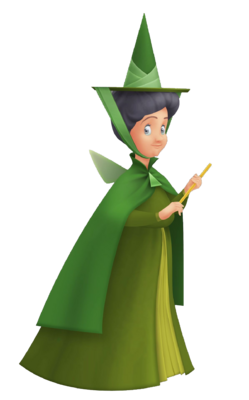 Fauna is the thinnest of the group, and wears a green cape, a lighter green dress, and an even lighter green skirt under the dress. She fastens her cape with a triangular, green broach. Her hat is green and the cloth wrapped around it is pale green. Her wings are small, triangular, and have a faint green tint. 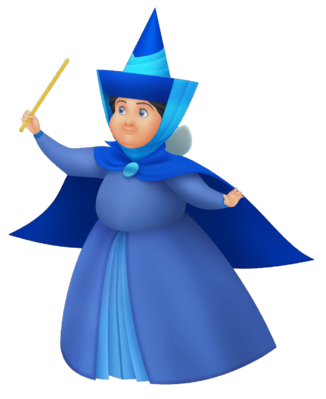 Merryweather is the most heavy-set of the three, and dresses in a dark blue cape, a blue dress, and a light blue skirt under the dress. Her cape is secured by a blue, circular broach. Her hat is blue and wrapped in light blue cloth. The three fairies can fly with their fairy wings and teleport in the form of magic sparks. Their main source of magic lies in their three magic wands, which have the power to create, shapeshift as well as erase things. They can also use their magic to minimize their size. Since they are fairies of good, they can only use their magic to bring joy and happiness, and aren't very useful in combat. However, they can use it to neutralize danger. The three good fairies of the land first appear in Sleeping Beauty at Princess Aurora's birthday celebration to bestow upon her their gifts. Flora gives her the gift of beauty to have the gold of sunshine in her hair, lips that shame the reddest rose and that she walks with springtime wherever she goes. Fauna gives her the gift of song, melody her whole life long, nightingales and troubadours that bring sweet serenades to her door. Before Merryweather can give her a gift, Maleficent arrives and is angered that she was not invited to the celebration so she also gives a "gift" to Aurora. She curses Aurora so that before the sun sets on her 16th birthday she will prick her finger on the spindle of a spinning wheel and die. After Maleficent leaves, Merryweather gives a gift to lessen the curse so that when she pricks her finger she will only fall asleep. After the party, the fairies plan to hide Aurora and keep her away from Maleficent until Aurora's 16th birthday. They take her to the forest, call Aurora "Briar Rose", and act mortal in front of her. They take her to the castle before the sunset of her birthday where Maleficent lures Aurora to touch a spindle of a spinning wheel. The fairies arrive too late to help her and cast a spell on all of the people in the castle so they don't find out. They go to find Prince Philip and help him defeat Maleficent and break the curse. Flora and Fauna are also terms referring to plants and animals, respectively. "Flora" was also the name of Walter Disney's mother. When the three fairies remember Maleficent, and went to inform Yen Sid, there were two different versions. In the Japanese version, the fairies simply disappeared; in the English version, they turned into a ball of light, much like in the original Disney film.